Gay Church of England cleric Jeffrey John has been given the backing of St Albans Cathedral where he has been appointed as the new dean. A group of evangelicals had called for Dr John to withdraw his acceptance. But their hopes were dealt a blow on Tuesday when the cathedral's chapter said it welcomed the appointment and had received messages of support. 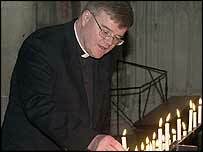 Dr John was forced to withdraw his acceptance for the post of suffragan Bishop of Reading last year. Canon Stephen Lake, sub-dean and acting dean at St Albans, said: "Jeffrey John brings to the abbey a track record of scholarship and preaching, and a commitment to mission. "The support for Jeffrey John from the cathedral chapter and congregation is clear. "The vast majority of the congregation have shown their support for the appointment and are looking forward to his installation and ministry here." Dr John, who is gay but celibate, is currently canon theologian at Southwark Cathedral. He will be installed as Dean of St Albans on 2 July. He withdrew his acceptance of the post of suffragan Bishop of Reading last summer after a storm of protest from conservatives in the Church of England. Where does Anglican balance of power lie?